Echocardiograms are performed and interpreted by the doctor with the family present whenever possible. 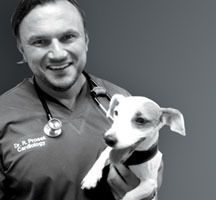 Ample time to discuss all of your concerns and tailor your pet’s treatment to your family’s needs. Follow up- we encourage ongoing communication with you and your veterinarian. The latest imaging equipment for immediate and accurate diagnosis. A detailed summary of diagnosis, recommendations, and treatment plan will be provided to you and to your veterinarian the same day. Excellence in client service – over 99% of our clients would recommend us to friends or family. 24 hour, 7 day a week emergency on call service for telephone consultations. Dr Prošek and Jerry, a rescue from SPCA in Key West Following a successful heart surgery of severe valvular stenosis which now is normal. 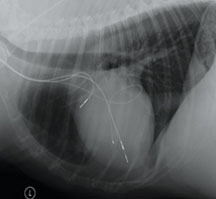 Pacemaker leads (3 of them) inside a dogs heart that was not beating fast enough.